Meet our cover star, Helen. She’s full of newfound confidence and is no longer dreading holidays in the sunshine. In fact, she’s thrown away the sarong and is daring to bare all in a bikini – and she’s looking gorgeous! Plus, we meet Weight Watchers lovebirds Phil and Kelly who’ve lost an incredible 19st between them, and ex-yo-yo dieter Diane who lost more than 4st and now feels ten years younger. And Oprah’s back! Now a year into her journey, she shares everything she’s learned along the way. Planning a picnic? In the mood for a barbie? We’ve got all the recipes you need for a summer of feasting. 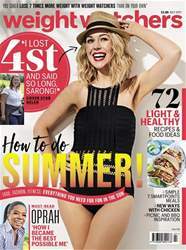 Plus, find out what Oprah’s been eating in our sneak peek inside her new book Food, Health and Happiness – hey, if it’s good enough for Oprah, it’s good enough for us! And of course we haven’t forgotten about dessert. Impress guests with our fruity zero SmartPoints jelly recipe, or cool down in the heat with a mango kulfi pop. Living in fear of the approaching summer months? No need! We’re on hand with loads of expert and member tips about food, fashion, beauty, fitness and health that are sure to keep you feeling and looking great in the heat. Check out stylist Anna Woodham’s advice for choosing the right swimwear for your shape, and follow fitness expert Jennie Gadsby’s free at-home workout routine to help you feel confident enough to wear it. Plus, we’ve sorted through all the beauty products out there to find the best summer buys for £25 or less.